Pool Man carries Dream Maker SpasTM. 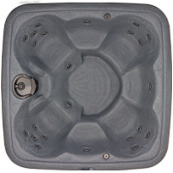 Not only do we sell and install these affordable hot tubs, we also have accessories and products to maintain your hot tub as well as the ability to service your tub. Dream Maker Spas are made in the USA. Our most popular models are pictured below. 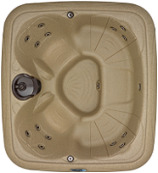 Dream Maker Spas are available in various colors and skirting options. 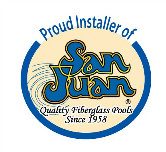 Click on the hot tubs pictured below to learn more about them. Having trouble with stress, arthritis, sleep disorders, diabetes, muscle soreness or joint pain? The power of heat and soothing warm water, combined with the massaging action of a Dream Maker Spa, has been shown to provide relief for these symptoms. Read more to learn about our new spa line. Health Benefits: Dream Maker Spas are ergonomically designed to ensure your body is enveloped in healing, restorative streams of warm water, while you enjoy the luxury of immersion and escape from everyday worries. Serious diseases such as depression, carpal tunnel syndrome, fibromyalgia, tendonitis, scoliosis and bursitis may be positively affected by hydrotherapy through a regular spa experience. In fact, some people afflicted with diseases as serious as multiple sclerosis and cerebral palsy have been known to experience relief of symptoms, thanks to hydrotherapy. 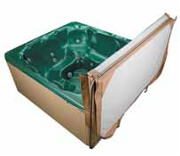 Features: Dream Maker hot tubs are manufactured in one solid piece so there are no weak points. All models are designed for the outdoors and are virtually indestructible. All Dream Maker Spas come with the “Convex2” Filter system with an integrated backlit water fall and Easy Clean cartridge. Getting to your hot tub’s pump for maintenance is easy due to cabinet panels that provide easy access from any side, and they are available in finishes that look like stone or wicker. 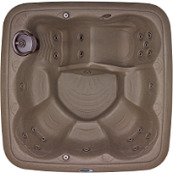 Dream Makers include Comfort Back Water Stream; specially molded contours built into hot tub seat backs allow a unique even flow of water up your back and spine. Dream Maker Spas feature unique bagged ROXUL insulating panels layered around the interior of the spa cabinet including the base. Unlike the low performance of blown-in foam, ROXUL maintains a high R-Value and is hydrophobic, meaning it will not absorb moisture, preventing the growth of fungi or mildew and ensuring the R-Value remains high. ROXUL is used in many new home builds for increased energy efficiency. This, along with the rotationally molded design, helps to make these tubs CEC (California Energy Commission) compliant. Dream Maker Spas can operate on either 110 volts or 220 volts. This means no special wiring is needed which can save hundreds! To learn more about these spas, stop by our store or visit DreamMakerSpas.com. 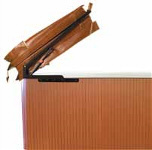 We stock a variety of cover lifts that aid in the removal of spa covers. Call or stop by today to learn more!